I just wanted to add that I'm not just thankful for the doctors - I'm VERY thankful for the nurses also. We took gifts to the hospital when we had Harper for all the nurses and we sent cards and thank yous to the nurses after our NICU stay. The doctors had the great wisdom to save Harper but the nurses were our ANGELS! WE love them too!!! Harper and I had a good day. We went out this afternoon to one of my favorite spots - Hobby Lobby and found several goodies to use for her birthday party. I'll write more about that tomorrow. 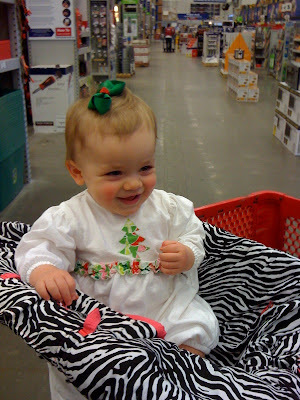 We also had to go by Lowe's to get some hardware items and Harper had a great time. All the old men shopping there paid her a lot of attention and she was eating it up! ha! She seemed to really like Lowe's - maybe she knows her momma used to be in the tool business and her grandpa practically lives there. Probably 10,000 times a day I have to say "No Harper" as she tries to go out the doggie door. I just THOUGHT she was trying to crawl out and then I happened to look outside. She has been taking all of her toys and throwing them out the door. (There were more toys on the ground). I took this picture two days ago and cleaned all of that up and today I looked out there and there is a huge pile out there again including several pacifiers. GREAT! I had a few extra Christmas cards and I decided I had to send them to the two men I'm most grateful for this year - the two neonatologists who treated Harper. Her wonderful Dr. Gomez in the top picture - he was her doctor at St. Francis and Dr. Wagle who treated her the night she was born and made the decision to air flight her out. I am thankful for all of those who prayed for her and especially for God because He is the one who healed her. But these men saved her life and I will be eternally grateful to them. So I am sending them a card along with a note to tell them how almost a year ago they saved our daughter's life and today she is a happy, healthy girl. How can you possibly thank someone who changed your life so dramatically? Speaking of letters..........have you written your Compassion child lately? You will never know how much the kids treasure your letters. I just wrote my kids. I hope you will do the same. Just thought I would offer a friendly reminder. You can do it on-line which is so easy! Update: You asked me what to write to your kids. Just tell them about you and/or your family. Seriously - they want to know what you do. What you like. What you eat for meals. Don't talk about materialistic things if possible (like we bought a new car/house/toys, etc). Tell them they are special and smart. Encourage them to study and that they can become anything they want. They need your encouragment. Tell them you love them and that God loves them. Depending on their age.....begin to tell them your favorite Bible verses. Let your kids write them. You just have no idea how these kids hunger for your love and encouragment. When we went to El Salvador I felt like I wouldn't know what to say to those kids and then they were hugging me and kissing me and it really didn't matter so much what I said but just that I was there. Same with your letters......It doesn't matter WHAT you write.......but just that you do write. Ha! The doggy door is too funny! I tear up every time I think of those two doctors and how thankful I am for them. Of course, we got to spend more time with Dr. Gomez and you know how we thank the Lord continually for sending us to Tulsa! 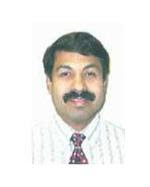 I didn't know Dr.Wagle's name but I 'm glad you do and think it would be wonderful to send them a card! God sent his two servants just at the right time! HIS timing is always PERFECT!! I just wrote Putri in Indonesia and sent her pictures. She is my compassion girl of 7 years, Love her :) Just praying that I can meet her. How wonderful are these two doctors! What a true blessing to all whose lives they have touched. I love the doggy door picture that is so cute! That doggie door just gave me quite a chuckle! So funny! I bet those two doctors will love getting a Christmas card from you and hearing that Harper is happy and healthy! That is so funny that she throws her toys out of the doggie door!! I guess you can never know what she's up to! lol! those toys out of the doggie door are SO funny! kids are hilarious!! How is it possible that Harper gets cuter and cuter?!? I am *loving* the doggy door! My 20-month old son has been putting random toys in the Christmas tree, and it is ADORABLE! I'm so thankful for Harper's doctors too!! Love her to pieces! Hilarious about the doggie door! Harper is so cute! And funny! I'm sure the neonatologists will be blessed by your card and notes! LOL about the doggy door! That is too funny! Sounds like your gonna have fun cleaning it up all the time! That is so perfect to send to the Dr.s who cared for Harper! When my miracle Kelcee was born I brought lots of bakery goodies and Godiva Chocolates to the Dr. and his staff along with cards! You can't thank someone enough to give you such a miracle along with god! Harper has the cutest Christmas outfits! Thank you so much for sending her physicians a card. I wish others would remember the physicians that are on call on holidays and 24 hrs a day the rest of the year. It is awesome that you are doing that!!!! LOVE the doggie door story! Too funny! She is too cute!!!! I have to agree with everyone else. The doggy door is hilarious! This post made me tear up! My girls were both in the NICU and Landrie was much worse off than Ella. I know that the Dr.'s were amazing and had their plans, but in our case, I am beyond grateful for the nurses that were there. They gave me such peace knowing that they were loving and doting on my babies through the night when I wasn't at the hospital. Dr.s and nurses are truly extensions of God's hands...thank you for posting this and reminding me just how thankful I am! Oh and Harper throwing stuff out the doggy door is priceless, I mean there is really nothing you can do but laugh! You laugh now! My step-daughter sneaked out of her house at 16 to avoid setting off the alarms at her mom's house...that was a bad night for her! Hiarious now but not too funny then. I'm sure Harper will make better choices. Oh my gosh--that is HILARIOUS about her chucking toys out the doggy door!!! Now you just need to train Dawson to bring them all back in!!! I LOVE the toys outside the doggy door. Too funny & cute! The doggie door is so funny. That's definitely a pic and story to save for Harper's senior year! I'm sure Harper's neo docs will love the card and letter from you. What great doctors. It seems like yesterday I came to your blog from a prayer request. God is good. I am very thankful too for the doctors at St.Francis EOPC....Both sets of my twins spent time in their nicu and they have the best docs and nurses. Too funny about the doggy door. Any tips on what to write to your compassion child? I am always stumped!! Thanks!! The doctors will be so very touched by you sending them cards. I just really appreciate your heart Kelly! You are so full of love and overflowing with the joy of Christ! That is so hilarious about Harper throwing her toys out the doggy door. It seems Harper is so full of personality and life. It does seem like just yesterday that I came across your blog shortly before she was born. I am sure your party will blow mine out of the water...cant wait! How sweet to send cards to the two doctors, sometimes it can be impersonal the people that brought the person into your life...I know that I dont know the people that brought Abby to me! The toys out the doggie door is great! What do you write to your compassion child? I always feel like we say the same thing and feel stuck. I feel like I send a generic letter each time. I've read all the ideas on the website but just feel in a rut. Thanks!! I have a 20 month old daughter and I can totally see her doing the doggy door thing. Thanks for a good laugh. That is a crack up that she threw all that out the doggy door. She is getting into mischief already! THANK YOU for posting what we should write ~ at the Women of Faith conference I attended in Seattle in July, I signed up to sponsor a child with World Vision (when I get this right, I hope to sponsor a Compassion child, too) and I have made my monthly donations but wasn't sure about letters, cards, pictures, etc. THANK YOU again for the great suggestions! OMGosh, love, love, love the doggy door "offerings" ~ so cute. I love the doggy door picture - way too funny! The doggie door cracks me up! I know that is what my daughter would have done too if we had one! I am sure the doctors will really enjoy getting those cards this year. I hope they know just how much it means to so many when they do their jobs so well! The dog door is too funny. I think it's a great idea to send her doctors Christmas cards! I just took my 7 month-old to see the perinatologist that I saw for most of my pregnancy. She had a tumor in her lung and has since had it removed and is totally fine! This doctor has kept in touch and I thought it might be fun to go visit her and when I got to her office she ran out and came to hold the baby--she said no one ever comes by once the baby is ok. That's so sad! These people work so hard to make "normal" possible for us! I'm sure they will appreciate it so much! My husband and I are sitting here drinking coffee and watching Good Morning America, well he is and I'm blogging. He, as always, asked what I was doing and I explained your blog to him. And then I began to tell him about Compassion and we decided we are going to sign up and sponsor a child. Just wanted to let you know that God is using you to do amazing things for his purpose! Harper is soooo funnny and soooo smart! 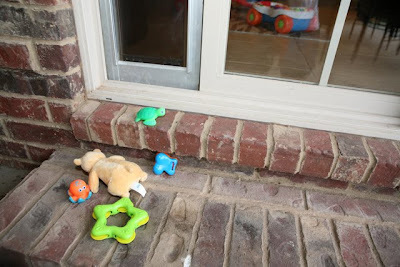 That is hilarious that she put those toys outside. I know those doctors will be so thankful to receive those cards. I am sure that a lot of heartache comes with their job so I know they will enjoy seeing how well Harper is doing! LOVE the dog door story! TOO FUNNY! That Harper is definitely going to keep you on your toes! Remember to add the doggy door story to her monthly "what you are up to these days"!!! That's adorable!! Love the white Christmas outfit...and the doggy door story is TOO funny!! And by the way, thank you for sending me to your cookie friend...All About Cookies. She is precious and her cookies are the best I have ever had! how hilarious that harper wasn't trying to escape through the doggy door but just throwing her toys out....loved it!!! Just wanted you to know that my husband and I decided to sponsor a child through compassion. We have talked about it in the past, but never just followed through. We are so excited to be apart of this little child's life! Thank you for your example! That doggy door thing cracks me up! What a character! That's so nice of you to KIT with Harper's Drs. I'm sure they appreciate that. I did write my Compassion child! Excited to hear back! Thanks for the gentle reminder to write to our Compassion children! We are so excited for our family Christmas to sponsor a second child. We are anxious to get her packet in the mail. The doggy door is too funny! My son went through phase when he put stuff in the air vent in his room. Even my keys a time or two. He was much older than Harper though. I love the toys outside the doggy door. Absolutely hilariou! I remember on of my girls just as she started walking would prop herelf up against the bathroom wall and just unroll the bathroom tissue like it was going out of style while I wasn't looking. Oh my goodness, she killed me, it was so funny. where did you get or who made, Harper's shopping cart cover?? My mom has a pattern for one that is the shopping cart cover as well as the highchair cover for restaurants but was wondering where you got hers. It's about that time for Shelby and the thought of putting her in those makes me itchy w/ germy-germs! ugh!! btw, she's precious! love her sweet smile! I love her! She is so cute. Thanks for the encouragement to write our Compassion boy. I've been a slacker on this lately and I know it would mean so much to him! Kelly, you are so sweet. I love your blog and reading about yours and Harpers mini adventures! The picture from the Doggie door is precious! Let me tell you that as a nurse , we all work very hard to do our best for every patient, and rarely do we even get a thank-you. I know the doctors will be grateful that you remembered their hard work and will be so pleased to see how well Harper is doing. So in advance, thank you for remembering that doctors (and nurses) are people too! Harper is such a doll. Thanks for the Compassion child encouragement! I am a nurse in the float pool at Springdale. I get to go to the NICU at Willow Creek every few weeks, and so I've worked with Dr. Wagle on a fairly regular basis. I love watching him work with the babies. He is so tender and caring. There are so many families like yours that he has touched. Thank you for thinking of him in your card-writing. Your Dad told me about the doggy door/toys today (or was it yesterday?)... I got SO tickled! Makes you wonder what goes through their little minds. I bet Dawson thinks Harper is SO silly. He is awesome and very thorough! Thank you for mentioning the nurses! As a former NICU nurse and pediatric nurse practitioner (currently a SAHM), I am always grateful for families who acknowledge what a great job their children's nurses did. Being a NICU nurse is a tough job b/c when it's sad, it's devastatingly sad but on the flip side, when it's good, it is soooo good! :) It's amazing to see God work in such tiny lives. The doggie door story is beyond hilarious! Teach Dawson to retrieve the toys for you. Then he will have a job and feel useful. He is such a cutie. Seems like Harper is going to have personality plus. What a fun time you have ahead of you keeping up with Harper. She is a doll. That's just too funny! I'm sure her "doggy door" missons will be at the top of the list or close to the top of funny things you remember as the years go by. I wonder what is going on in her little mind? Plus she carries it all out without Mama being none the wiser. You may have to rig up something to lock it when need be.....................or until she gets to big to fit through it...................perhaps she'll do what my son did to "escape"................just go out the window! (don't worry, bottom floor! He was none to happy with his "time out"..........so out the window her went). These are the best years of your life Kelly, and it's apparent that you realize that.